From our attractive self catering holiday accommodation, or deluxe Bed and Breakfast rooms and suites, you can take wonderful walks and explore the rural villages and their delightful pubs and restaurants with their old world charms. 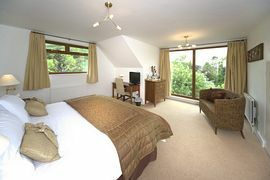 The accommodation comprises three 1st floor generous luxury Suites and two ground floor very high quality Bedrooms. Two suites and one of the rooms have Super King-size pocket sprung luxury divan beds (that can be converted to twin singles if preferred). The third suite has a king-sized divan and the other bedroom has twin beds. All have ample storage and are furnished with top textiles and decorations. The suites each have a comfortable sitting area. All rooms and suites have a flat screen TV equipped with digital Freeview and built in DVD player as well as a tea and coffee making facilities. Each suite has a large private bathroom en-suite with full bath and 'drench' shower. One bedroom has a bathroom with full bath and 'drench' shower the other a large walk-in drench shower. 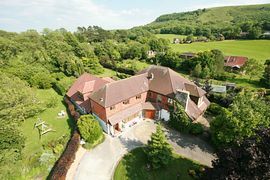 Of course each has unsurpassed views of our three acres of gardens, the Ditchling Beacon, and the South Downs Area of Outstanding Natural Beauty recently designated our newest National Park. 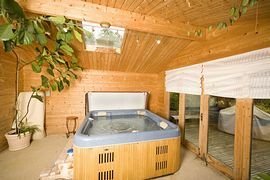 All our B&B guests have free use of our year round indoor swimming pool, sauna and hot tub. There is a large and sumptuous guest lounge with Inglenook Fireplace that has room for all our guests and their visitors to meet and chat or read at one end and at the other end there is a 50 inch flat screen TV with further seating for about six people. We have a richly appointed Dining room in which we serve the full English Breakfast daily and which can be booked (at least 24 hours in advance) to serve meals for parties of 6 to 12 people. As we are fully licensed we can provide drinks in the Lounge and at such a pre-booked lunch or dinner party. There is ample parking for all our guests and their visitors. The ambiance is quiet understated luxury in a family country home setting. Up to two Children can share in parent's suites or one in the Ash room in the B&B one travel cot offered subject to availability. Turn left at Pyecombe onto A273 signposted Hassocks. After about 1.5 miles turn right on to B2112 New Road signposted Ditchling. After 1.8 miles turn sharp right on to Beacon Road signposted Ditchling Beacon. After 0.8 miles turn left on to Underhill Lane. Tovey Lodge is 1st Drive on left 100 yds from junction. 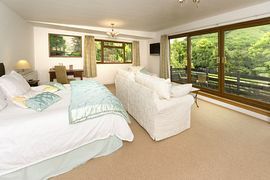 Beautiful B&B set in a stunning rural.. 8 Mar 2010 Location, run by extremely helpful and friendly. The house and its grounds are immaculate and set in wonderful surroundings. The rooms are warm, comfortable, well furnished and very clean. Jacuzzi and swimming pool are a definite bonus, although sadly we only had time to use the former. ... Amazing Service 15 Feb 2010 Stayed here for a two night valentines getaway weekend with my partner and all I can say is this place is amazing! From the moment we arrived to the day we left we were treated more like family than customers. None of the faceless, ... Excellent accommodation and service all round. 13 Dec 2009 My wife and I stayed here for one night on Saturday, 5th December 2009. All I can say is the service we received was first class from the time we arrived to the time we left. The owners are very friendly and also very helpful. lovely 1 Dec 2009 Ideal for a getaway, very quiet, spacious, clean and high standard of accommodation. Owner very hospitable. breakfast excellent. recommend for romantic/getaway, very peaceful Extremely pleasant hosts! 28 Aug 2009 Service here was excellent, starting with a warm welcome and tour of the comprehensive facilities available - well appointed, clean and bright room with excellent shower in en-suite. Large lounge with books & DVDs for use if desired. A superior bed and breakfast well suited 9 Aug 2009 We stayed in a first floor suite with a large room, great views of the South Downs and a well-appointed bathroom. Good room amenities such as TV, wi-fi, coffee and tea for the early morning, etc. made this very comfortable.